Though it occasionally appears on lists of “short long trails” in the US, Pennsylvania’s Loyalsock Trail is still fairly unknown. That’s unfortunate, because not only is it a wonderful scenic trail, it’s also a great way to get an end-to-end thru-hike under your belt in relatively short time. The Haystacks, near the end of the trail. The LT has a nice mix of forest, vistas, streams, and history. Angel Falls, reached via a short side trail at mile 23, is a must-visit. Farther on, the historic buildings near mile 20 offer a look into the past, and Alpine View (mile 36) and World’s End State Park (mile 46) offer scenic valley views. Near the end of the hike, the “Haystacks” of Loyalsock Creek are a cool geological formation and a nice area to relax. The trail follows old railroad grades, logging roads, Native American paths, and trails laid by the Boy Scouts in the ’50s. Though there are a fair amount of water crossings, most are small and you may be able to rock-hop all of them save the final one over Loyalsock Creek, where a car/pedestrian bridge is provided. Small water crossings like this are typical of the LT. Most of the LT runs through State Forest land, which generally allows backcountry camping following LNT principles. There are a few sections that follow roads and private land, where camping is not allowed; it also passes through World’s End State Park, which only allows camping in official campgrounds. These areas are all spelled out in the Alpine Club’s trail guide. Generally speaking, there are established sites at the best places to camp, and most of the sites have water sources nearby. 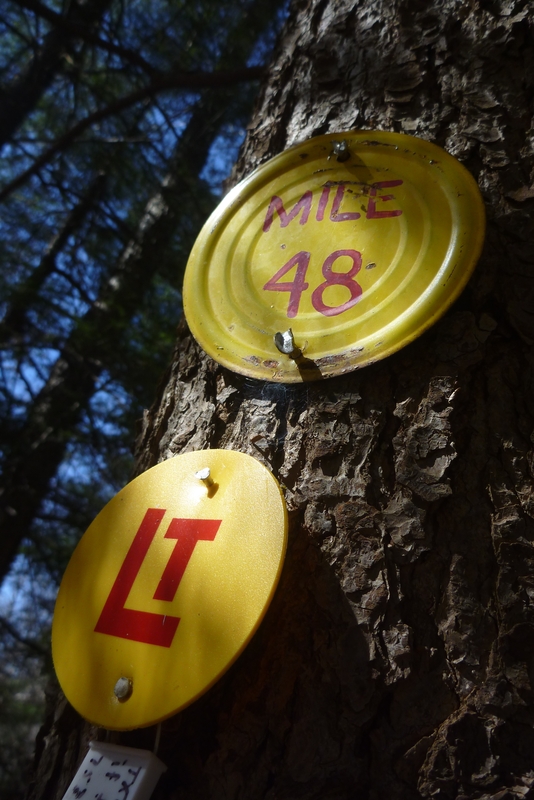 Old-school mile markers help track your progress. 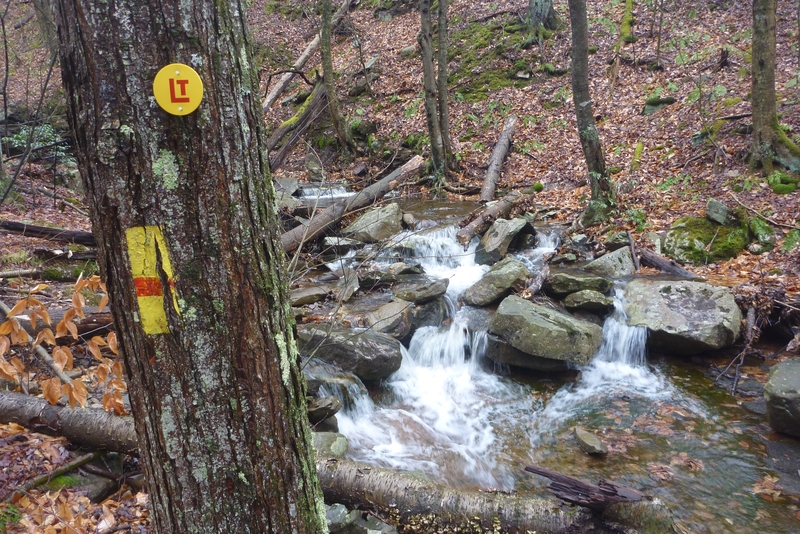 Most LT thru-hikers start at the Western trailhead. This gets the hardest part of the trail out of the way first (the first five miles are quite hilly), and saves the most scenic area (World’s End State Park) for the end. If you’re using a shuttle service, it also leaves your car in a bigger, nicer lot. The fastest known finish time appears to be an absurd 13 hours and 32 minutes, though most of us aren’t in that kind of shape. I suggest a minimum of four days/three nights for the trail, though it would be easy to stretch it to four or five nights without it getting boring. 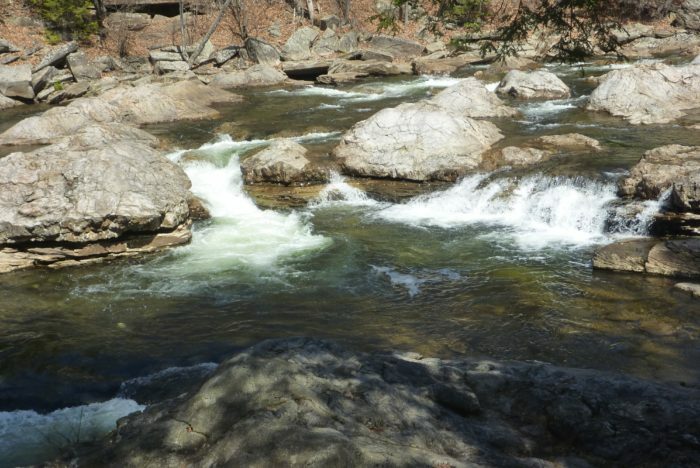 Water is fairly plentiful along the trail, as are established campsites. The Alpine Club’s guide has great information about distances between both. If you have two cars and want to set up a shuttle of your own, it’s certainly possible. However, the Western trailhead only has parking for a few cars, so get there early if you want a spot. The Eastern trailhead has plenty of parking and a nice, well-maintained restroom. It’s about 45 minutes from one trailhead to the other by car. If you need a shuttle service, the Alpine Club has a listing on their site. Their site looks like it’s from the ’90s, but the shuttle information seems to get updated regularly, and was current when I hiked it. Expect to pay around $40/person for a pickup at one trailhead and a drop-off at the other. You may also try crowdsourcing a shuttle from the Loyalsock Trail Facebook group. I thru-hiked the trail in March; it was still cold (down to 20 degrees), but there was no longer snow on the ground. I had the trail completely to myself between miles 5 and 59. 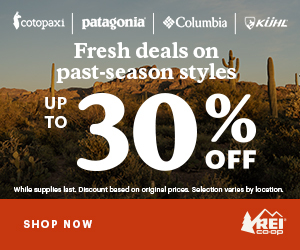 The two best seasons are probably Spring–when the trail’s numerous streams and waterfalls would really come alive–and Fall, which would be a great time to visit for the foliage. One time that is explicitly NOT recommended is during bear and deer hunting season, which stretches from the Monday before Thanksgiving to mid-December. Check with the Pennsylvania Game Commission for exact dates. 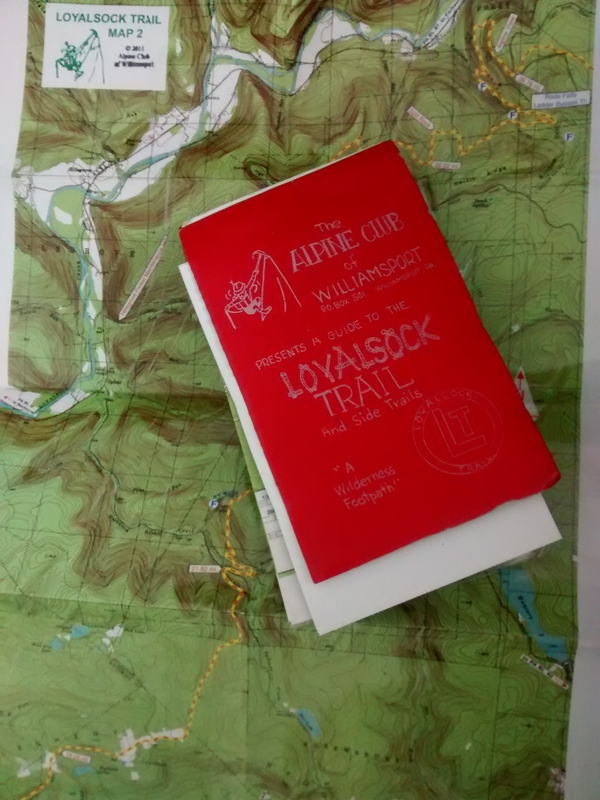 The Alpine Club of Williamsport’s Loyalsock Trail Guide is a must-have, and comes in a rustic-looking cover. It’s very detailed, featuring maps, historical information, mileages, and campsite suggestions. You can purchase it by mail, online, or at certain retailers in the area, including the World’s End park office. This trail is amazing. My partner and I through hiked it while we lived in PA. I through hiked the Loyalsock Trail several years ago. We took 5 days and enjoyed every minute. We had the whole trail to ourselves! I want to go back and see how fracking has changed the area. Planning on thru hiking this trail with my son and possibly one daughter in the summer of 2018; maybe around July 4th weekend. Great write up. My wife and i thoruoghly enjoyed this trail! Also enjoyed the West rim if you’re looking for another end to end hike. Next up the Quehanna trail. I hiked this trail some 23 years ago. I was 18 years old and I had been a troubled youth, as far as law enforcement is concerned. I was placed into a boot camp styled punishment program and as part of this programs last phase of rehabilitation they would take us on what they called a wilderness phase. We spent 3 weeks living completely in the wilderness. They took us to the LT and I remember talking about it with the staff that was taking us on this expedition. They kept saying “the first mile was on a grade that was so steep that you have to ascend it using your hands and feet like climbing a ladder”…. and let me tell you this was absolutely true. We hiked 5 miles of the toughest terrain I had ever seen at that point in my life. Our back packs weighed around 60 pounds and we carried at least 3 surplus canteens full of H20, as we were attacking the trail at the tail end of July into August 1995. When we finally reached the spot that we were going to set up camp for the 1st night the trails treacherous +/- in elevation and the rugged terrain caused my legs to tremble for the whole last mile of that first 5 mile hike. I couldn’t believe how much that first day I pushed my body. There were other guys that weren’t nearly as physically fit as I was and they had to be tied off to us bigger and more competent hikers to make sure they made it to the campsite. We did a lot of trail maintenance as we hiked along during layovers for a couple days here and there. The views from the certain lookout points were amazing. At one point we had a great view of were we had hiked from and I finally understood why the hiking was so hard. Rapid ups in downs in elevation because we were hiking straight across a bunch of steep ridges. The Flora was amazing. Such colors and scents as everyt plant was in complete vegetative growth. As far as the wildlife goes, I seen the biggest timber rattlesnake I ever seen. It was as thick as my forearm at it’s thickest point. We also had a couple encounters with foraging black bears interested in our campsite late at night. I didn’t know it back then, but the guide who lead the hike actually wrote the book on low impact camping and was a world renown rock climber named Jay Whitecloud. We rock climbed a little place down towards Gettysburg called white rocks and I seen Jay free climg the face to set up our belay lines. Then a day later while we were practicing repelling- for a future repelling trip to New River Gorge- and I personally seen him run down the rock face, face forward with no harness or figure 8. He just grabbed a rope with his bare hands ran down the face. When he reached the bottom he had skin hanging from his fingers and palms. It was the craziest thing I ever witnessed. Sorry for getting off track there. It ended up being the hottest summer in years that year and we seen 3 or 5 days of 100°F weather. On the hottest day that year we covered 15 miles with our packs on. It was 110° that day. The last leg of the trail is absolutely stunning as you traverse the Loyalsock Creek at the haystacks. This beautiful stretch of Creek is almost like going to a water park, as the undulating rock bottom and the round haystack rock formations that give that part of the creek is name, create fast moving channels that one can sit and get swept down stream as if it was a water slide. The water was crystal clear and there was deep holes and all kinds of fossils that can be seen in the rocks. Works End Park is a very easy last leg of the trail and a wonderful way to see the natural beauty of that region. We spent 3 days at one sight near the park just so we could enjoy all the wonder of Worlds End. 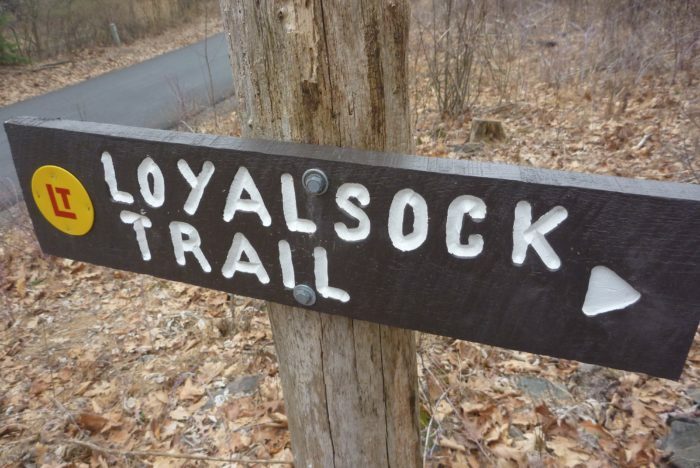 The Loyalsock Trail is a great trail for beginners and very experienced mountaineers. Just go there prepared to test your endurance. If you are going by yourself, or with just you and another person, be sure to share your plans for the hike with someone that can make sure that you get help if you don’t show up when and where you’re supposed to. There are many rattlesnakes and plenty boulders to break your ankles on. Of all the trails that I’ve hiked in Pennsylvania, the Loyalsock Trail is the king of all of them.